Planet Ark Power has unveiled what it says is Australia’s largest privately owned solar and smart battery system, installed on a car dealership in Ipswich, Queensland. 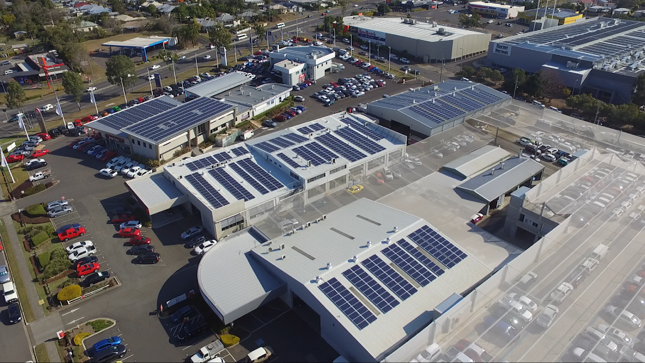 The 330-kilowatt solar and 96kWh battery storage system installed at Llewellyn Motors in Ipswich, Queensland is expected to cut energy bills by $2 million over a 20-year period. Improving the return on investment in Planet Ark Power’s dSTATCOM (distribution static synchronous compensator) inverter technology, which will allow the system to get around restrictions on exporting to the grid by monitoring grid power requirements and scaling the system’s output to match this. The technology – which was developed with grant support from the Queensland government – is being trialled at the Ipswich site, following approval by grid operator Energex, and is one of the first demonstrations of the technology in Queensland, where commercial-scale systems are typically not allowed to export to the grid. Planet Ark chief executive Paul Klymenko called the technology the “missing link” in commercial solar viability. A Planet Ark spokesman said the dSTATCOM technology had received in principle approval from grid operator Energex, and if it got the go-ahead to be applied more broadly would be a big step forward for commercial-scale solar in Queensland. It could even be a boon for the residential space, where solar is generally limited to 25 per cent of the transformer capacity in an area. With the technology, whole suburbs could be 100 per cent solar powered without impacting on the voltage control of the grid network. Others predict it will boost momentum in the peer-to-peer trading space, as large operators take advantage of being able to feed into the grid at scale. Llewellyn Motors dealer principal Wade Llewellyn said the export capability made the system “cashflow positive from day one”. “With the battery technology on top of that we will be able to improve the business case as the years go on and electricity prices go up,” he said. The battery can store a portion of the unused power and then determine the best time to sell, in terms of both income generation and relieving peak demand on the grid. Planet Ark Power executive director Richard Romanowski said widespread use of such a system could push power prices down. “Imagine if multiple large roof space industrial sites across the network were able to export cheap solar power into the grid during periods of peak demand,” he said. With the Queensland government recommitting to at least 50 per cent renewables by 2030, boosting commercial solar could be a valuable contribution to this target. The technology is also getting noticed in other states, with a North Adelaide site soon to have 6MW of solar with a 3MWh battery and the dSTATCOM. Planet Ark Power is a partnership between GoZERO Energy and Planet Ark to boost the slow uptake of solar in the commercial, government and education sectors.